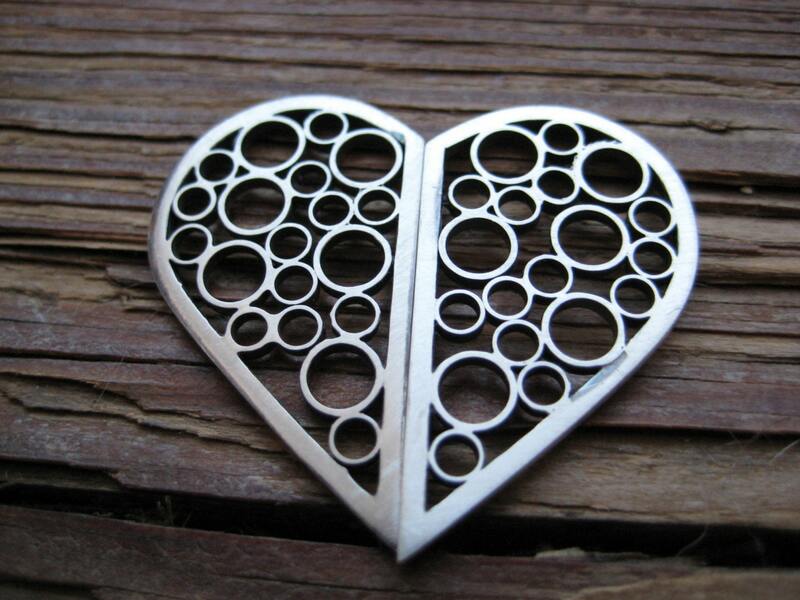 This month's installation of EtsyMetal's Blog Carnival is: My First Piece of Metalsmithed Jewelry. I am pretty sure this is not my first piece, but it is probably the first piece that was in the slightest bit complicated or that I designed. Its a very tight fitting choker. Funny to look back at it after all this time. 12. Nina Dinoff http://ninadinoff.blogspot.com - thats me! I am part of a group of metalsmiths who all sell their work on Etsy and several of us have decided to play a little game. 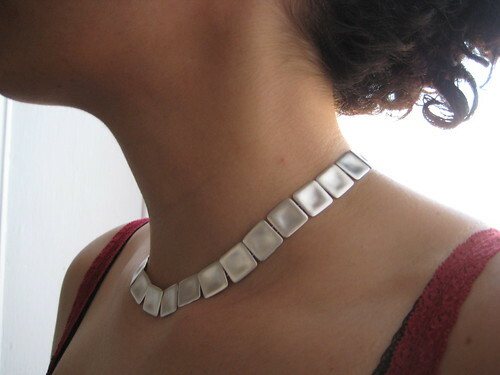 Every week we are going to reinterpret the challenge that the designers on the show Project Runway do, but in jewelry. The idea is to free us up to do work that is outside of our comfort zone and many of the results are amazing. You can stay tuned to the EtsyMetal blog to check it out. Here are my pieces from the last two weeks. This week's challenge was to design a chic look for a pregnant woman. The first thing that came to mind for me was that women's fingers expand and they can no longer wear their rings. so this is a ring that expands from a size 5 to a size 6. it still needs a bit of clean up, i was in a rush to get it done last night. Last week's challenge was to design something for the red carpet. I wanted to create something that was very dramatic and sparkly, so I used swarovski crystals. Originally, I wanted to use clear ones and oxidize it like the little one I am also showing, but I didn't have time to get them and had these blue ones. 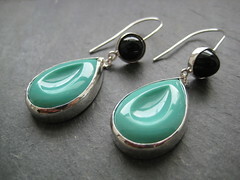 I felt that with the blue crystals it seemed a little more bright and fun in the silver. What do you think? I'm so glad the NYIGF is over. The show was not a huge success due to the economy, but I was able to attend a seminar on managing orders and leads and I thought it might be helpful to share my notes. I hope you find it useful. This means sending out an invoice as soon as you ship the order and making sure that everything is totally correctly. You don't want to have to call with corrections. Also, include a packing slip with the order. I think the assumption here is that you would be shipping to a large company. I know for me many of my customers are small and I could probably include the invoice with the order, but the point is to do it all at once. I personally write my orders pretty sloppily and so I asked about sending out a digital confirmation and the panel agreed that would be a good thing to do. So I am getting on that today! They also recommended sending hand written thank you notes. It is important to touch base with your customers as often as you can and to create a personal connections. All of these are essentially excuses to let them know you exist. It was nice to hear advice not to be shy about following up. I know for me this is very hard both to stay on top of and to have the confidence to do. Some ideas for questions to ask included calling to make sure their info is correct, asking about how they display the product, and of course, asking how the product is doing in the shop. You might want to suggest how to display it or offer to do an exchange on work that is not selling for them. The panel emphasized this over and over again. It is not the process you use, but just implementing one and sticking with it. Make a plan to follow up on leads for the next 90 days using the five steps above, and make sure to capture where you got the lead from. Personally, I just started an excel spread sheet with all my contact info in it. Now I need to figure out the follow up part. - Include some kind of call to action. - Send samples and literature. They showed a postcard that used an image of the booth to remind the customer who they were. 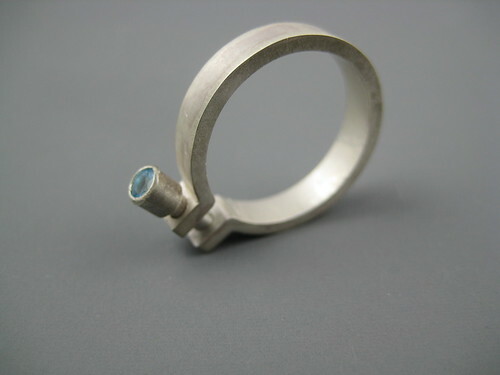 I think in the case of jewelry it is probably important to show the work itself as it is so small. OK, that's all I got. I now need to work on exactly what to say when following up. I would love to hear people's thoughts! Last week I spend 5 days at the New York International Gift Fair. I can't tell you how exhausting these shows are. Totally different than a retail show where you get a lot of people looking, at trade shows a lot of them just walk on by. This is a picture of my booth, but I am going to be completely redesigning it for the next show I do, which may not be the same one. It looks lovely, but it's not exactly how I want it to look, so stay tuned for a major overhaul! Some exciting things that came out of the show are that my work was picked up by Carol Saunders Gallery in Colombia, South Carolina and I have been invited to do the Local-to-Global Jewelry Artist Mart at the Walker Art Center. I will be there November 14. More info to come. I'm continuing to add to my cog line. Next up: Hoops! I am really excited about these. I have been thinking about expanding my wedding line for a long time now. With a lot of stones sitting around and the knowledge that people really like my Cogs line I decided to start there. Here is the latest edition. A super delicate little band with a rose cut champagne diamond. Stay tune for more! I'm the feature on the Etsy Metal Blog! Wow, I have not blogged in a while! I am super busy getting ready for the New York International Gift Fair. At them moment, I am being featured on the Etsy Metal blog so check it out! A few days ago I returned from an amazing trip to Penland School of Crafts in North Carolina. While I was there I participated in the Radical Jewelry Makeover, a project where jewelry artists use donated materials to create new work which is then sold off to raise money for Ethical Metalsmiths, an organization that raises awareness about mining practices. I am going to do a series of posts to show the process, but to begin with I wanted to share the work I did while there. 4 of the 6 pieces were donated to the sale. I spent the entire first 3 days working on a piece that I never finished! But I am happy with my final results. 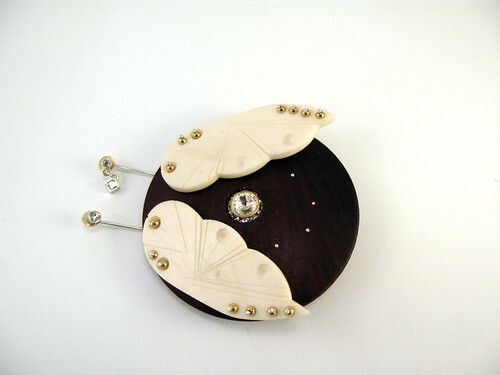 All the work is made from donations to Radical Jewelry Makeover. The metals are either reclaimed, that is melted down and milled into new sheet and wire, or simply reused as is. Reclaimed sterling silver, reused gold chain, reclaimed gold clasp, and plastic beads. 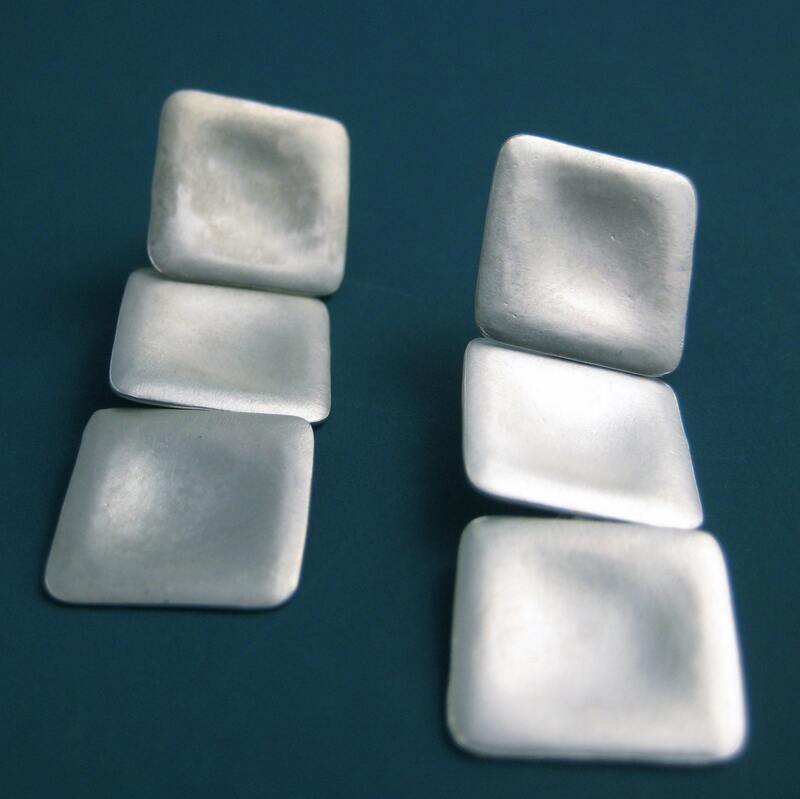 My original idea revolved around some lapiz beads that I wanted to cut down and tile, but when I tried to cut them down in the glass shop they came out too uneven. Then I found these pink plastic beads and voila. 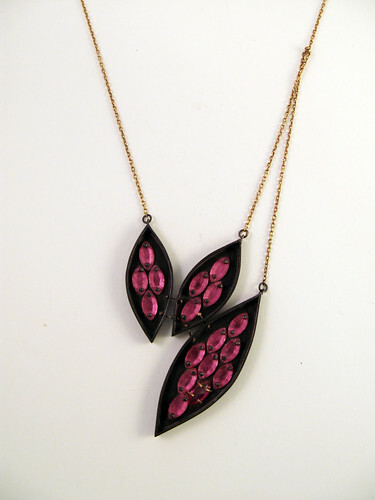 There is one odd tourmaline pink colored one set with gold prongs. They did not take a pic of the back but all the pins are riveted on the back. 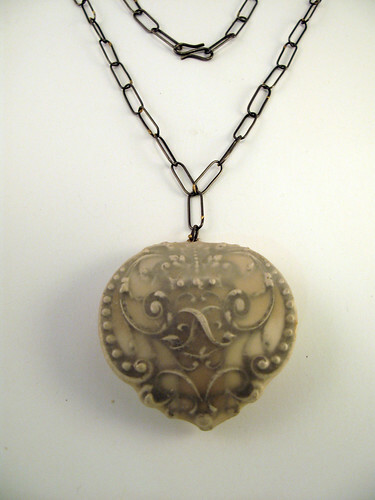 Florence Hardyman, a Penland saint and big collector of jewelry purchased this one at the sale. This was the first piece I finished and just a bit of fun. The main body of it was a large pendant from a wood bead necklace. The wings are plastic with little gold plastic balls riveted in place with silver. In some spots the rivets attach the wings to the body. In the center is a countersunk glittery paste earring. 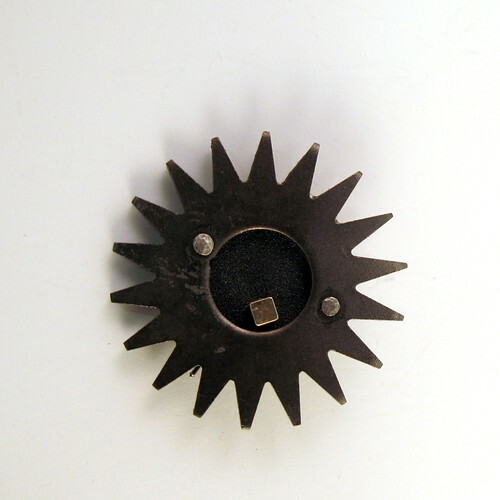 The back has a two prong pin stem. Each eye is a found fake diamond earring, one with a teardrop and each has a gold sequin with it. I really love how this one came out and almost bought it back. The pendant is just a large potmetal piece that I found. After talking with Mina Takahashi, who was teaching the paper class, she agreed to make me some sheets of translucent abaca paper. The paper was wrapped around and sealed with methyl cellulose. When it dries it tightens like a drum and you are left with this wonderfully mysterious shroud. I made the chain out of reclaimed sterling silver and 18k gold solder. I definitely plan on exploring this idea further, so stay tuned. 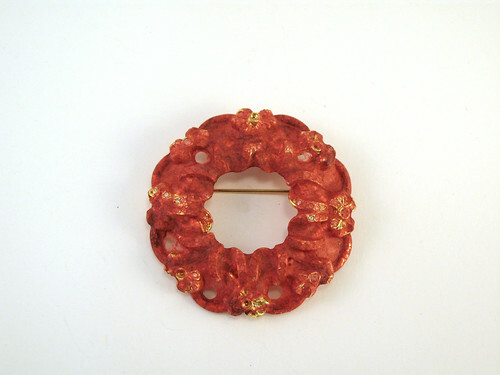 This brooch was simply dipped in pigmented abaca pulp. I just wanted to see what would happened and the results were pretty cool. One day my friend Erica purchased some sandpaper at the Penland store and I was struck by the luscious blackness of it. Mine is always sort of gray. I used a piece of steel that Paul (noformdesign) had sent me to frame it. Riveted it to a silver pin back (again, im sad i dont have a photo of the back) and riveted a gold earring in the center for contrast. Simple, but i like it. I got to keep this one. I ended up keeping this one as it got dented when it went flying due to a broken split mandrel and I didn't have the time to fix it. It is made of two found gold rings. One was a 14k gold prong set "diamond" ring and the other a tiny size 3 3/4 wedding band, also 14k. I turned the shank of the engagement ring inside out so the 14k is visible to the wearer (you cant see that in the photo) and used the wedding band as a sort of bezel on top. The CZ from the engagement band is set in the middle. I loved the idea of combining the wedding and engagement rings into one, but also making a new ring with a clear reference to the old rings. About a month ago my kitchen was completely redone by my landlord. I was able to pick out most of the fixtures within his budget and was really happy with how it turned out. Well, today I took my sick kitty to the vet and when I came home all the cabinets were on the floor! Most of my dishes destroyed and my heart broken. Some of the dishes were very special ones that my mom and dad had purchased in Italy in the 60s. Above all, I am really shaken about what might have happened if someone or my cat were there when it all came down. I can't stop thinking about it. I am going to insist that when the cabinets are replaced he has it done by a licensed contractor. Two margaritas later, I am still in a bit of shock and a bit shaken. A little stop in Urban Outfitters brought these Anni Albers necklace kits to my attention. First of all, I didn't even know they existed! And to find them at Urban Outfitters was really beyond my ken. If you dont know who she was, she was not only the wife of the famous designer Josef Albers, but she was also a founding member of the Bauhaus. 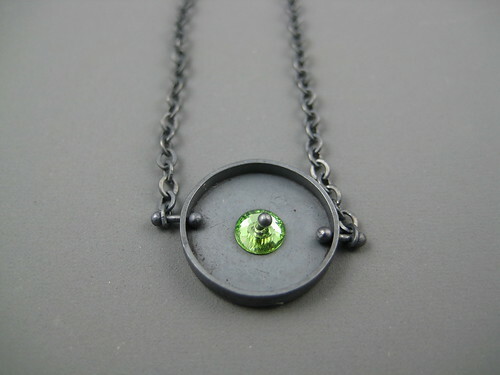 She is mostly known for her wonderful textiles, but she also made these great pieces of jewelry from found objects. I first discovered her at a retrospective of the couple's work at the Cooper Hewitt several years ago. Next stop, H&M. To my shock they had this Stooges shirt there! I almost purchased it. I have to admit I love the bedazzled logo! But the fit was not great and I decided I didnt need it. Now I kind of want to go back and get it! Finally, on the way back to the subway I walked by the Prada store. They had this wonderful window display. The suitcases look like they are made out of paper. I also sort of love how it makes reference to Prada's legacy as a bag company. I think most people don't realize that it was started by Muiccia Prada's family and they used to do luxury bags only. I have a bag from the 80's of my mom's. Anyway, I just love the graphic imagery of this display. I've been working really hard to prep for this show and have been trying to come up with lots of inexpensive items to offer. I am just in love with these. 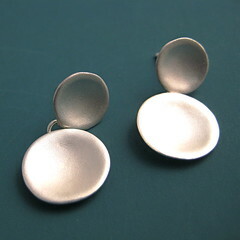 They are 3D brass stampings that have a dimple in the middle soldered to a sterling disc. Super simple but they pack a punch... and they come in two sizes! Now available in my etsy shop. I've added more items to my Mod series. I love simple forms and it doesn't get much simpler than this. They are all for sale in my etsy shop. I have been working on explanding my collections and I am finally getting around to posting some of the items to my etsy site. Check em out! I'm very excited about these new earrings. I have been hard at work to expand my orecchiette collection. These earrings feature two little orecchiette. The small one is 3/8" and the larger is 1/2". This have quickly become my new favorite every day earrings! I am closing out my Swizzlet bracelets and they are now available via the shop on Poppytalk Handmade. Check out all the other great new spring and eco friendly items on there! I am closing out my Swizzlets and offering the bracelets at the wholesale price of $35. Come and get 'em! 20% off your order in both my shops when you enter "Valentine" at checkout!!! I posted this new necklace to my etsy store a little while ago, but I am very excited about it so I wanted to share it here as well. It's an outgrowth of my orecchiette collection , but in a square form. I am calling them chiclets for now, but I am not sure if that is what I will stick with or not. I love how much more substantial this necklace is. A few days ago I finished a couple of new rings. 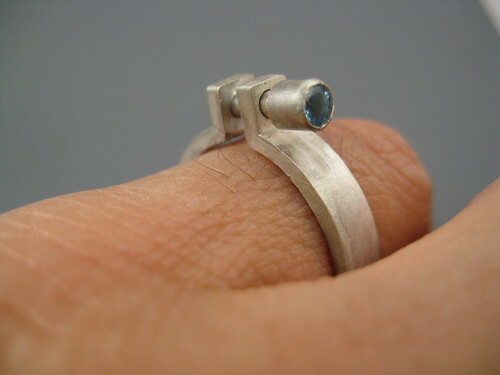 The cog ring is an addition to my cog series, but the other rings are entirely new. 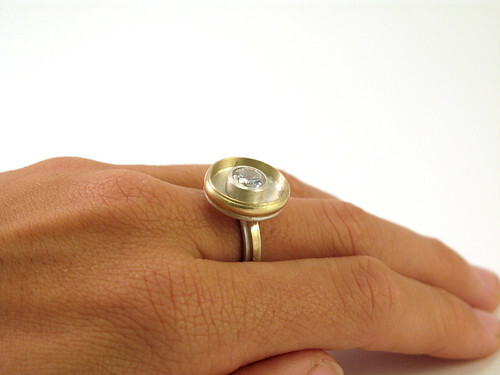 I am trying to work on more wedding and engagement rings, so stay tuned for more to come! So this is my first attempt at a blog! I am not entirely sure what to say on here yet, but check back in for new photos of my work and links to design items that I find!